Preheat the oven to 400 degrees F. Prepare a 12-cup muffin pan with nonstick pan spray or line the muffin cups with paper liners. Combine the peaches and lemon juice in a small bowl. Stir to mix; set aside. 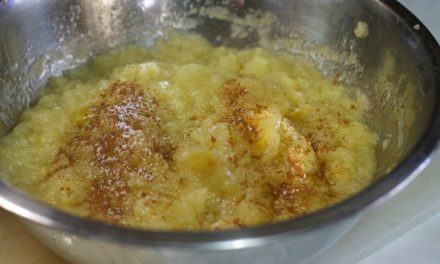 In a large bowl, combine the flours, sugar, baking powder, mace, and salt; mix thoroughly. Beat the egg, oil, and milk together in a small bowl. Add to the dry ingredients and stir until the flour is moistened. Fold in the peaches. Divide batter among the muffin cups; each will be about 2/3 cull. Bake about 25 minutes, or until a toothpick inserted in the center of a muffin comes out clean. Remove the muffins from the pan immediately to avoid sticking.